An aerial view of one of the parking areas at the University of Malta in Tal-Qroqq. The University Students' Council (KSU) has complained University staff informed it too late of ongoing works, leading to an increase in parking problems at the iniversity. The council was informed by some university staff members that the car park at the gateway entrance would be closed because of ongoing construction work a few weeks ago, council president Carla Galea said . Another four projects, including a new sports complex, were also taking shape concurrently, the KSU president added. 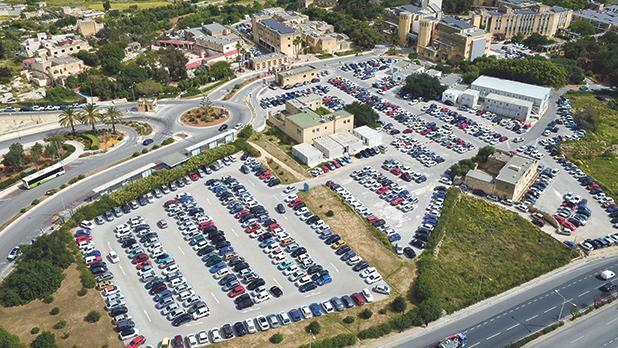 However, information on the ongoing works reached the council at a very late stage, not leaving it with enough time to prepare for "the drastic change" in parking, Ms Galea said. To make matters worse, the parking closure also happened during exam time, Ms Galea added. Meetings were immediately held with the University administration to postpone the works until after the examination period to avoid any further confusion during the stressful period, Ms Galea said. The situation also highlighted the mobility problems, not just at university, but across the country, the council added. The council appealed to the university to increase communication and for authorities to prioritise alternative means of transport.